The main goal of this project is to contribute towards climate resilient agriculture in Ethiopia and Sudan, and build the research and teaching capacity of partner institutions in climate smart agriculture. In countries like Ethiopia and Sudan, climate change has resulted in variability of rainfall, increase in temperature, degradation of natural resources and frequent crop and livestock failures leading to food and nutritional insecurity. It also changes the insect pest, disease and weeds dynamics affecting both the crop and livestock systems. 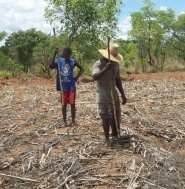 Thus moving agriculture into a more productive and resilient scientific based practice is an urgent need, and it calls for improved management of natural resources (soil, water, land and genetic resources) using conservation agriculture, integrated pest management, agroforestry and sustainable diets (FAO, 2012). Climate Smart Agriculture (CSA) has been launched by the leading development agencies like FAO as a response to these challenges. Climate smart agriculture refers to the sum of scientific based agricultural practices that enhance agro-biological diversity, productivity, efficiency, conservation of natural resources, and lowers dependency on external inputs. The objectives of CSA are to increase food production and farmers income, make agriculture less vulnerable to climate change (adaptation) and contribute to reducing GHG emissions from agriculture (mitigation). CSA can be practiced in different ways depending on the socio-economic conditions. It integrates various disciplines in an ecosystem approach to promote food and nutritional security, and adaptation to climate change. In addition to ensuring the sustainability of food production and natural resources management, CSA turns the agri-business from the one that aggravates climate change to that, which contributes to its mitigation. It comprises conservation agriculture-based resource saving techniques (Nyssen et al., 2011, Tesfay et al., 2011, Tesfay et al., 2012). The project will take strengthening the teaching and research capacity of partner institutions as its core activity. This will be done through training, staff exchange and procurement of equipments. Moreover, the project promotes gender equity by preferential support to female household heads, students and staff to improve their participation in science, policy and decision making. Sixty students, among which 50% (30) will be female, will train at M.Sc. level. All the candidates will be attached to the aforementioned research themes. Scholarship will be offered to 18 female M.Sc. students. Besides, the remaining 13 female students will get small grant to cover incidental expenses. - The project will offer scholarship and research fund to six academic staff from Ethiopia and Sudan to pursue PhD in Norway. Besides, four academic staff will be supported to join the in country PhD training. -The research component of this project focuses on development of scientific practices in CSA. The research focus will be on the development of CSA technologies and CSA farms. This project will take Conservation Agriculture (CA) as a point of departure for developing research and capacity on CSA. CA is based on the principles to minimize soil disturbance (zero tillage), complete soil cover (mulching) and improved crop rotation. The CSA farms will be one of the key activities of the project and the focus is on integrating promising CSA technologies and creating synergies between the different technologies. These technologies can be improved varieties, tillage and mulching methods, improved soil fertility management, integrated pest and weed management, agroforestry and improved livestock systems. The project will assess total productivity of the farm, total farm income, labor input, gender differentiated labor demand, capital needs, GHG balance, and stability of production, Net Present Value of the investments and farmers perceptions. At the same time the project will characterize the traditional farms in the area with regard to these factors in order to make a comparison with the traditional farms. These CSA farms will also serve as research and training sites for students from the universities. They will also be used as demonstration sites for the extension service. The project will test the “hypothesis of hope” developed by ICRISAT (Cooper et al., 2007). This hypothesis claimed that agriculture production will be reduced by climate change unless new climate technologies are introduced that can address the problems of climate change. The ICRISAT research team showed through a modeling exercise that such technologies are available. Our research project will test “hypothesis of hope” under real farming condition. We will show that it is possible to face climate through development of climate smart technologies in crop and livestock production. Project sites in Ethiopia are Borena, Loka Abaya, Halaba and Ziway in the South; Enderta and Hintallo-Wajirat in the North, and in the Sudan research sites will be selected from Demokeya and Dameera areas. The selected sites represent semi-arid conditions with high level of vulnerability to climate change and food, nutritional and income insecurity. The research will be conducted in a multidisciplinary manner to address the diverse natural, social and economic problems faced by small holders in the project areas. - In addition to the PhD and M.Sc. training that serve to strengthen the partners’ institution capacity, 20 academic staff from Ethiopia and Sudan, and 18 staff from Norway will take part in academic exchange. The faculty from UMB will engage in curriculum development and review, seminar and graduate course offering, and joint supervision of graduate students. The faculty from Ethiopia and Sudan will involve in exposure visits, short training and research while in Norway. There will also be South-to-South academic exchange for joint curriculum review and development, and experience sharing. - 30 technical staff from LMIC will get in country training of equipment maintenance. - A CSA networking will be established to ensure a smooth, continuous and fast knowledge sharing. - Three short term trainings (30 participants) will be offered in the field of administrative systems. - Sixty female administrative and academic staff from Ethiopia and Sudan will take part in tailor made training. - The partner institutions will get funding to procure scientific equipments and field vehicles to improve their teaching and research capacity. Women participation in education, research and policy making has been low in Ethiopia and Sudan. The currently proposed project will contribute to alleviating the problem through financial assistance to female students. At least 50% of households to be involved in research and extension will be female headed. In addition, 50% of the M.Sc., PhD and short term training participants will be female. Eighteen female students will get full scholarship during the two years study period, while 13 additional female students will get small grant. A special short training will also be given to 60 administrative and academic staff from LMIC. The ultimate target groups for this project are primarily subsistence farmers and pastoralists in the semi arid rural parts of Ethiopia and Sudan. Due emphasis will be given to female headed households. In addition university lecturers, technical assistants and administrative workers would benefit through long and short term training. Again here due attention will be given to female candidates. All these target groups have taken part during the baseline survey. Further, the stakeholders will be actively involved from site selection and problem analysis to implementation of the project activities, and its monitoring and evaluation. All stakeholders will also participate in the inception workshop to contribute to its planning and implementation. The monitoring and evaluation of the project will also be transparent and participatory.